Greetings from India. I was wanting to send this mail for quite some time to congratulate and compliment you and your team for bring out such voluminous collection of CBRNe related issues each month through the News letter. It must be involving tremendous work collecting, getting approvals, compiling and putting in a systematic order the huge volumes of information. I go through the news letter in great detail and update myself on the subject. Thank you for your great service to the humanity. Wishing you and your team continued success in your endeavors to serve the humanity. I saw the last newsletter. Congratulation! It is very good and complete. I will share it with everybody that is looking for similar subjects. This is an excellent product. Thank you for sharing it with me. I would like to get your permission to include your articles in our bi-weekly newsletters. We have over 10000 subscribers who read our significant activities reports on regular bases. "I was just reading your "CBRNE-Terrorism Newsletter" the other day, and it seems apsolutely interesting and very well done. One can see a true expert is behind all that work! Congratulations!!!" Thank you for your newsletter and all the information contained therein. A very useful source of relevant CBRNE information and material to download. Happy New Year to Greece! Having just found your newsletter website, can I congratulate you on a job well done. It’s great to have so many resources available from one site. Also would it be possible to have a password for the 666 section please. Thank you for the mail and new issue. It is always very enriching to read the CBRN Terrorism Newsletter. Thank you! Thanks a lot for this "small" Newsletter - really impressive! Have sent it to the NBC School in KORNEUBURG. Dear Sir, many thanks for your message, and thank you for sending me the link. I just visited CBRNE -Terrorism Newsletter and I think it is a very comprehensive site over such an important topic. Thank you for being gracious, taking your time, creating this website/newsletter and forwarding this valuable information. As one who have personally been in your presentation/training, I know that how much we are in need of both your academic and operational knowledge and wisdom. Greetings from Mexico where I am on research for 3 weeks. Thanks for sending the latest edition -- it looks an exciting issue I am looking forward to reading it. Extraordinary and really amazing work! Thank you very much for the inclusion of my articles in the CBRNE-Terrorism Newsletter. I've really appreciated it! At the same time I would like to congratulate you for the excellent publication with very interesting topics and articles. The work you and your colleagues have done is outstanding! 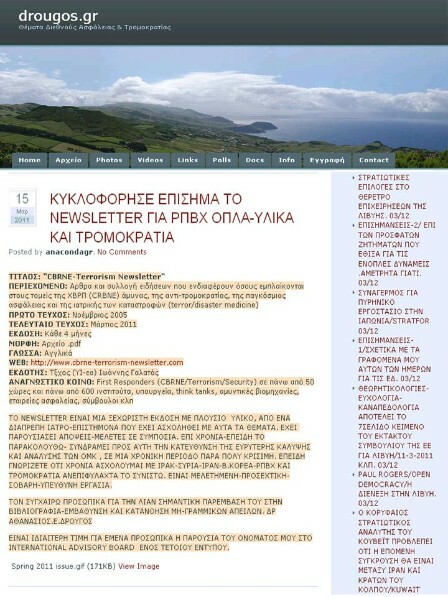 The Newsletter is a quality product for the CBRNE Community in Greece and abroad! Director, Research Institute for European and American Studies (RIEAS), Greece.